Below are common attributes associated to Orange Tea Olive. Become a care taker for Orange Tea Olive! Below are member comments regarding how to plant Orange Tea Olive. No comments have been posted regarding how to plant Orange Tea Olive. Be the first! Do you know how to plant Orange Tea Olive? Below are member comments regarding how to prune Orange Tea Olive. No comments have been posted regarding how to prune Orange Tea Olive. Be the first! Do you know how to prune Orange Tea Olive? Below are member comments regarding how to fertilize Orange Tea Olive. No comments have been posted regarding how to fertilize Orange Tea Olive. Be the first! Do you know how to fertlize and water Orange Tea Olive? Below are member comments regarding how to deal with Orange Tea Olive's pests and problems. No comments have been posted regarding how to deal with Orange Tea Olive's pests and problems. Be the first! Do you know how to deal with pests and problems with Orange Tea Olive? Looking for Orange Tea Olive? Get Orange Tea Olive fresh and large directly from the grower to your garden! Buy Orange Tea Olive online from the nursery wholesalers and save BIG! 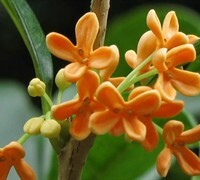 Plant Orange Tea Olive (Osmanthus auranticus) in a location that provides well-drained soil and full sun to partial shade. Tea Olive is useful in the landscape as a large evergreen shrub or small tree to about 12 feet or so in height. As a shrub they are useful to create natural hedges and buffers or to frame in the corners of a home, building or other structure. When tree-formed, Tea Olive can be useful as a focal point specimen anywhere in the sunny landscape. I suggest planting these close to windows or near outdoor living spaces where the fragrance from the flowers can be enjoyed. To plant, dig a hole no deeper than the root ball and two to three times the width of the root ball and fill it with water. If the hole drains within a few hours, you have good drainage. If the water is still standing 12 hours later, improve the drainage in your bed, perhaps by establishing a raised bed/mound. Turn and break up the soil removed from the planting hole. If the native soil is dense, compacted or heavy clay, mix in a good organic compost or soil amendment at a 50/50 ratio with the soil removed from the planting hole. Remove your plant from its container and carefully but firmly loosen the root ball. Set the plant into the hole you've prepared, making sure the top of the root ball is slightly above the soil level. Pull your backfill soil mixture around the root ball in the hole, tamping as you go to remove air pockets. Then water thoroughly and cover with a one to two-inch layer of mulch. The way you grow Tea Olive will depend on how you prune it. Tea Olive can be grown as a large shrub or small tree. When grown as a shrub, it can be used to form a natural hedge or screen, frame the corners of a home, or as a specimen. In this case, there is no pruning required. Grown as a more formal hedge, it can be clipped as needed. Tea Olive can also be limbed up to form a very attractive small tree. To tree form, simply remove lower branches and stems to a desired height. Tree-forming can begin when the shrub is two feet tall or higher. Feed Tea Olive with a well-balanced shrub and tree fertilizer that is slow-release and contains a good amount of iron and/or sulfur. Alternatively, you can use a natural or organic plant food. Always follow instructions on product label for application method and amount to apply. I've seen no serious insect, pest or disease problems with Tea Olive. On rare occasion here in mid-Georgia, when temperatures have dropped below 10 degrees F, I've seen some cold damage to the youngest growth, but plants usually bounce back fine in spring. Consistently wet soil can cause problems with the roots.